Happy Kitchen Sink Stamps Monday, I'm so glad you stopped by! Today I have a card using Kitchen Sink Stamps Multi Step Lilacs to share with you. My Lilac bushes are starting to bloom, I can't wait for them to fully open, I just love when the smell of Lilacs fill the air! Be sure to scroll down, I also created a video tutorial for stamping the Lilacs. 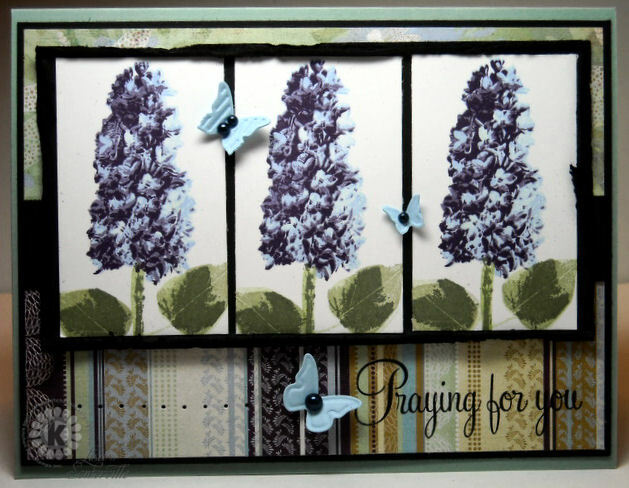 I used the small Lilac, stamping on White card stock, then added the stem and leaves (see Video and color recipe below). The stamped panels are layered on a Black panel where I used the Torn Frames Technique. The pattern paper is from the Basic Grey Wisteria line. I added the sentiment from Kitchen Sink Stamps Words of Comfort and Joy set, stamping in Black on the pattern paper. The butterflies are cut from Bashful Blue card stock using the Beautiful Wings Embosslit. I love your fabulous video, Lisa! What a great tutorial on the lilac! Your card is a stunning beauty!! I love the sweet butterflies and the divine BasicGrey background. They looks sensational with these gorgeous lilacs!! Your card is wonderful!! I love the lilac stamp set. Your video was great! Oh my Lisa! Your card is stunning...love the pretty lilacs and the fun paper! Your video is outstanding! What a wonderful tool!! your card is beautiful! The lilac seems so real, at first I thought you painted it! I have never seen so many layers stamping. The video is a great way to learn about it, thanks! This is so beautiful!! I love the colors of the lilacs. Fantastic video tutorial, too! Way to go, Lisa!! Lisa...simply breathtaking and the perfect PP with this set.. Putting KSS on my wish list. what a wonderful card - love the lilac stamps. Gorgeous card Lisa.... beautiful color combo! Another awesome video .... I am totally enjoying the the "Somerville Tutorial Videos"... and look forward to the next one! ;) You go girl! I am luvin' the video, so nice to watch the KSS expert! Beautiful card! Oh wow, another gorgeous card Lisa.